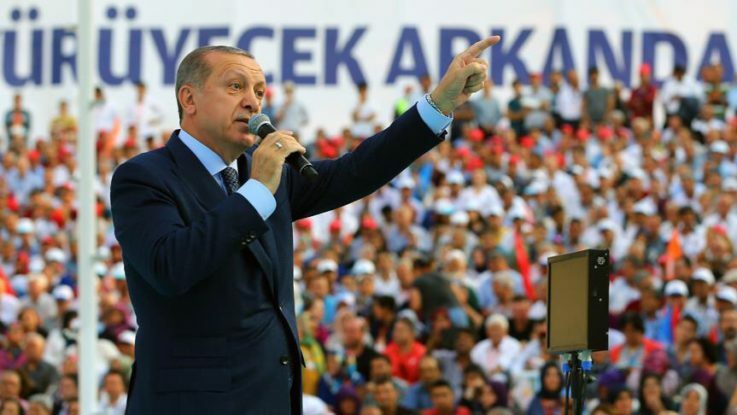 Turkish President Recep Tayyip Erdogan reiterated on Saturday his call on ethnic Turks living in Germany to vote for those who are “not hostile to Turkey” in the upcoming elections to be held in September. On Friday, Erdogan had called on ethnic Turks not to support major parties including “the Christian Democrats, the SPD [Social Democratic Party] or the Greens,” calling them “enemies of Turkey”. There are an estimated 3 million people of Turkish origin living in Germany. An estimated 1 million can vote. German Foreign Minister Sigmar Gabriel had criticized the Turkish president’s Friday remarks saying they constituted an interference in the German general election, which is scheduled to take place on Sept. 24. “He does not know his place. How are you speaking to the president of Turkey? You speak with the foreign minister of Turkey. Know your place,” said Erdogan on Saturday. Erdogan’s remarks come after another week of tension between Ankara and Berlin, particularly over comments by German Chancellor Angela Merkel appearing to rule out a renewal of a Customs Union deal between Turkey and the European Union. On Wednesday, in an interview with young video bloggers, Merkel signaled that the EU would not enter into talks with Ankara on modernizing the Customs Union, due to recent political tensions. “Some European countries have made a habit of threatening us in every area that comes to their minds,” Erdogan said in his remarks. He added that the European countries preferred to raise tensions with Turkey instead of supporting Ankara’s fight against terrorism. Ties between Ankara and Berlin have been strained in recent months as Turkish leaders slammed Germany, accusing it of turning a blind eye to the activities of outlawed groups and terrorist organizations hostile to Turkey. Ankara has also criticized Berlin for failing to demonstrate strong solidarity with the Turkish people in the wake of the defeated coup in July 2016, that left 250 people martyred and some 2,200 injured. The Fetullah Terrorist Organization (FETO), which organized the foiled coup bid, has a large network in Germany, with dozens of private schools, businesses and media organizations. Since the coup attempt, nearly 4,000 FETO suspects have come to Germany from Turkey and other countries, according to local media reports. Apart from FETO, the terrorist PKK group is also active in the country, and carries out significant propaganda, recruitment and funding activities. The group has nearly 14,000 followers among the Kurdish immigrant population in Germany, according to the BfV domestic intelligence agency.